HEEEEELP MEEEEEE I HAVE LIKE 7 ANXIETIES ABOUT THIS SERIES. No wait. I have nine anxieties. Seriously I am so stressed out right now. AH. AH. AH. So Vol #4 was filled with many new plot twists that TOTALLY threw me. I honestly cannot predict what is going to go down next. And is it bad that I'm kind of devastated that Light (view spoiler)[has quit being Kira??? I FEEL SO BAD BUT OMG EVERYTHING HAS CHANGED. (hide spoiler)] My brain is spinning. Ahem. • I really didn't like the introduction of Misa, the second Kira. Like, ugh, it was just "here let's throw in a girl who has no motivations or life or anything except a CRUSH ON A BOY". It was really insulting for girls all over the universe actually. • So while Misa was cute, she had no complex character development. CONFUSING. Because all the other characters are so epic. • But yet....THE PLOT TWISTS AROUND MISA WERE AMAZING. • And I was so stressed out in this one because AHHH the heat is really turned up high. • Also "L" doesn't sleep. • And he exists on donuts and tea, apparently. But dude, you need a nap eventually, right? • Why is Light's hair so fantastic? IT JUST IS. • Basically this one leaves me craving the next book quite severely badly. I have NO IDEA WHAT'LL HAPPEN NEXT. • I also am liking how we get to know more about the shinigami (god of death) and all the rules around the Death Note too. Things got a little more complicated here, and it's interesting to know the shinigami's weaknesses. • Also I love the art and expressions. IT'S LIKE READING A MOVIE. • Okay goodbye now. I need to go devour mooooore. This one is definitely my least favourite because of the terrible introduction of a semi-love-interest, but is also STILL AMAZING because it's so compelling and the twisty. 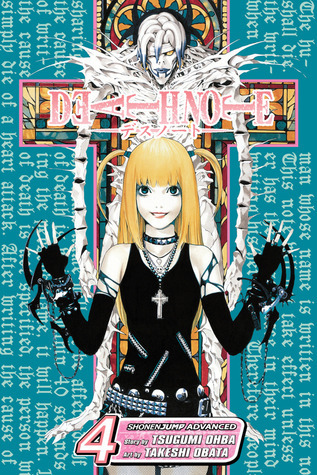 Sign into Goodreads to see if any of your friends have read Death Note, Vol. 4. 0.0% ""Cait are you addicted to this series or something? "\n \n NO WHY WOULD YOU ASK WHAT MAKES YOU THINK THAT. I'M CALM ABOUT IT ALL, I SWEAR." Oh, I cannot WAIT to see how your thoughts end up. I'm glad you like it! This series is so intricate and intense and I can't wait to see what you think about the rest of the manga. @Charley: I can't wait either. XD I just want to DEVOUR THEM ALL IN ONE SITTING. @Darnia: Excellent advice. XD So far I'm not reading other's reviews, ehehh. WHEN DID YOU START READING THESE?! ?